I met Shane Bzdok through his ongoing involvement with Thinking for a Living, “an ever-growing platform dedicated to the concept of open source design education.” His self-initiated project Design Facts is “focused on graphic design history, contemporary design facts and industry related definitions.” It quickly caught my attention for its simplicity and enduring potential to learn and re-learn about the galaxy of design history. Here, Shane shares more about his fact-rich project. I spent my early childhood on a small farm in North Dakota where my father, who was a designer, photographer, and classic car enthusiast, was publishing his own car magazine out of our home. We actually had an eight-foot horizontal stat camera in our house! Needless to say, I was exposed to both graphic design and an interest in history at a very early age. Currently, I work as an art director and designer with Bob Borden and Duane King at BBDK, Inc., in Santa Fe, New Mexico Razorfish in Austin, Texas, where I also contribute to our passion project, Thinking for a Living. Design Facts is a very literal description, actually. The content is graphic design trivia with an emphasis on historical information. I also plan on including a sprinkling of contemporary facts, industry-related definitions, and possibly even designer quotes. 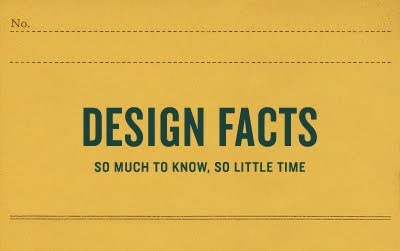 When and how did you arrive at the idea of Design Facts? I’ve always had an interest in history, both design related and non-design as well. I’ve recently begun collecting vintage design publications, and it seems the more I collect, the more I enjoy looking back at designers and their work and identifying the contemporary connections and subtle (or often not-so-subtle) references surrounding me today. With this in mind, I began to consider how I could share my enthusiasm about this topic with others. After some digging around online, I soon found my white space—there appeared to be a lack of sites that offered graphic design history or facts delivered in short form. I did, however, find more than a few sites that focus on lengthy passages of design history, but they are either too deep or very focused on one or two particular areas. As far as I could tell, there was nothing that offered a constant feed of general graphic design facts delivered in daily, bite-sized bits (not to say they don’t exist). I shared the concept with Duane, who then came up with the very fitting name of Design Facts, and the lovely little tagline, “So much to know, so little time.” Thanks, buddy! What makes for a compelling Design Fact? In my opinion, it’s the behind-the-curtain, lesser-known information—the minutia—that is most compelling. The tiny details that get lost or are typically ignored in the bigger picture of more generalized text in classroom history books. In the case of graphic design, I also believe it’s not so much the “who, what and when” as it is the “how” and “why.” We’re so used to seeing beautiful, polished things done by brilliant people, but it’s how these things came into being and why the creator made them that typically make for a good story or, in my case, an interesting fact. That said, I think any fact or piece of information, no matter how common or seemingly mundane, can be compelling to someone. If even one tiny bit of information can spark curiosity and the desire to learn more, then I feel I have succeeded. I really want this to be a practical educational resource for both students and non-students alike. I am constantly amazed at how very little entry-level designers know about the heritage of their craft and those who came before them—this included myself at one time. movements, methods, books, films—of Design motivate you? Above all else, I am motivated by the phenomenal intelligence, talent, kindness, and raw creativity of my peers and other Thinking for a Living Network partners, whom I am fortunate enough to call my friends and co-workers. These include Bob Borden, Antonio Carusone, Frank Chimero, Ian Coyle, and especially my career-spanning mentor, Duane King. They constantly inspire me to do better. I would also like to add that the longer I’ve been doing this, the more I realize that nearly anything and everything can inform, inspire and motivate. Business, science, nature, economics, mathematics, and everything else in between all have something to offer for those who are looking. I try not to rely on specific formats or methods of inspiration, but instead, try to keep my eyes as wide open as possible and hope I can recognize inspiration when it appears in front of me. My only piece of advice is to be sure to get away from the computer once and a while. The real world is great. It’s ultra high-res with immediate download. Why did you decide to use Twitter to help realize Design Facts? Square peg, square hole. I had a concept that involved bite-sized content delivery and here was a publishing platform that offered exactly that. Pretty easy decision, actually. I also include a link to an image reference for each post which I manage on Flickr. Flickr not only acts as a stable depository for all the images but also has the ability to capture additional audience. I had done some early Photoshop comps of a site design I was really happy with, but once I made the decision to use Twitter as the publishing platform, I felt the design didn’t translate well. 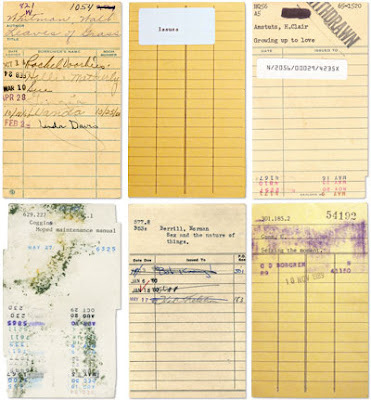 While doing some research, I had stumbled across some photos of old library cards (above). The mustard yellow paper, formal typography, date stamps, and handwritten names on these old cards were both beautiful and immediately spoke of academia. Obviously, there’s not much I can affect in regards to the overall look and feel of a Twitter page, but I’m quite pleased with the end results none-the-less. What is the most rewarding part of making Design Facts? The act of passing on knowledge has always been very fulfilling to me, so knowing that someone has discovered something entirely new about graphic design is definitely the most rewarding part. That and the fact that I am learning more about graphic design myself through this process is also quite rewarding. Every time I crack open a reference book or dig a little deeper into a somewhat familiar topic, I add a little bit more to my own mental archive. The really interesting part is that the more I look, the more apparent the connections become. I begin to see the threads of inspiration that connect different eras and designers; how a typographic trend in one decade influenced an entire generation of designers in another. It’s all quite fascinating. Nothing really feels hard when you enjoy what you’re doing, but I suppose maintaining the schedule is probably my biggest challenge. Fact is, nobody else is going to do this for me so I realize the only way for it to succeed is to literally make it part of my everyday routine. I learned this from Duane, actually. He’s made Thinking for a Living a permanent addition to his morning ritual, so I already knew what I had to do. Also, through my professional experience, I’ve learned the value of managing expectations on the viewers’ side. I intentionally limited my posts to one per day for many reasons, but mostly so that I could keep up with it and make sure I deliver. Never take being on time for granted. It’s very important that people can count on you, even at the smallest levels. and turn it into a project? as it travels design history? As practical and seemingly perfect as Twitter may be for this project, my long-term goal is to develop a full-scale website that will allow me to better brand the project and allow for a more cohesive delivery of text and image. What’s great about the efforts I’m making with Twitter is that it’s allowing me to build up a database of facts for the real site, when that day comes. In closing, I want to thank my long time friend, mentor and creative director Duane King for all of his guidance and inspiration. I wouldn’t be the designer I am today without him... and that is a fact. Images courtesy of Shane Bzdok.